I am gratified someone wrote a book describing some of the cultural components of the 2014 Referendum campaign, because that was what the referendum was about for me. Summer of Independence by Andrew Redmond Barr, not only carries this out, but records the oomph and ardour created by National Collective. The history of the independence movement since the Second World War to date is covered in six pages, and this allows Andrew to place National Collective in ‘a long thread of troublemakers’, listing the era as composed of ‘Wendy Wood … Hugh MacDiarmid … the four Glasgow students, led by Ian Hamilton, who in 1950 took the Stone of Destiny’ and linking directly to ‘unaligned organisations like National Collective’. It gave me cause for pause and I wondered if National Collective were as significant as those others. Having read the book, and having over the last few years appreciated the effect the National Collective had, I will agree with Andrew Redmond Barr that it deserves his place. I say this because people still talk about the National Collective, and from it a stream of indy based media continues to flow. National Collective was many things, but it was probably never built to last. The introduction for most of us to the Collective was a sleek website with slogans and articles from many first time bloggers, sharing their thoughts, experiences and hopes. After that, National Collective could be traced through social media to an increasingly broad range of public events. There remained however a core group of brain-stormers and campaigners, and Andrew Redmond Barr was one of them. Many of the ideas from National Collective caught on as naturally as if they had always been there. Most potent were the hand held placards that visitors to their events were photographed with – – placards that read I AM NATIONAL COLLECTIVE. For the majority of Scots following the referendum on social media the ongoing photographs were a first-hand sign of the swell in feeling for the years up to 2014. Although the Collective were rarely reported on by larger media, including the BBC – – who Barr complained to at one point, he writes – – National Collective touched more hearts and minds than any other cultural movement of the time. In fact, I do not think that anybody began to appreciate National Collective’s reach until it had gone. After all it was a group that was able to communicate well, and generally in a few words, or with an image and idea – – ideal for our online selves and for those who were for whatever reason not to be found stepping out to cultural meetings of an evening. The On The Road section of Summer of Independence tells the tales of the National Collective’s trip around Scotland, and fun as it is, the strength of the Collective was probably somewhere nebulous online, or at the back of our minds. Having little time for party politics and less understanding of economics, during the referendum I sought out the cultural equivalent during the debate, and the National Collective somehow provided that across the country, everywhere and nowhere at once. I think ‘what’s the point’ indeed, and although Andrew Barr is polite enough not to bemoan the lack of cultural discussion, Alan Riach’s point is spot on. The Summer is over for now (cue the Autumn of Independence!) during which we watch the UK slowly fall apart. Independence will come and although it won’t be the same, the fight has been proved possible, worthwhile and energising by National Collective. This is because it is only artists that can tell us this – – while it is politicians that sit in parliament, it’s artists that we believe in. 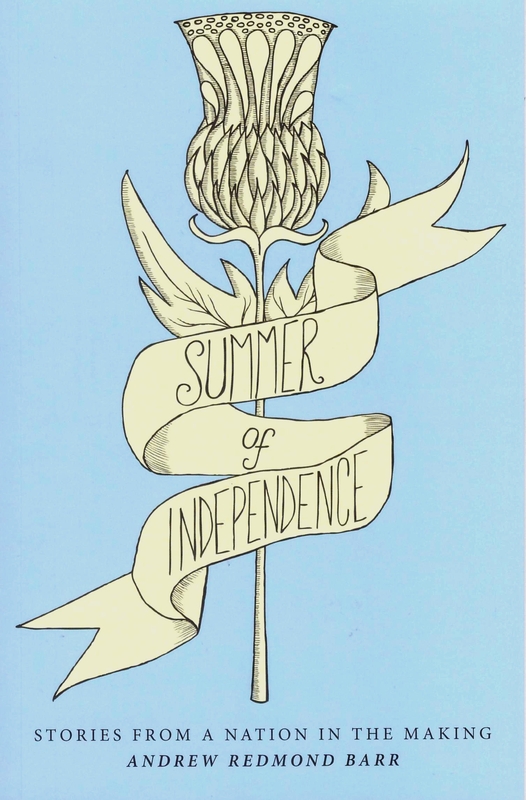 Buy the Summer of Independence by Andrew Redmond Barr here. Gey richt thair tae, an yon Scots langage is wir main strenth an differentiation factor, as weel as bein fundamental tae cultur. Juist a peety yon state dinna taucht Scots bairns thair ain langage, whit maks fer wir moistly indoctrinated unionist/Anglicised cultur and wi Scots cultur intentionally doon hauden. You are right though on culture being key: folk either felt more Scots or more British, other issues were always secondary. Hence this is why 80%+ of English born folk living here voted No – they don’t feel Scottish, and the ‘prood Scots’ fi private schools/80 meenit patriots etc felt mair British than Scots. Widna maiter if Scotland wis ane o the richest nations on earth (as we were), they voted as per their dominant culture. The economy etc was a side show. We have been lucky in Scotland to have a ready made Centre-left alternative to The Labour Party in the SNP. Had this not been the case I think we might have been heading much more rapidly along Ukipper-Trump Street. As things stand the SNP are going to have to find some way of making life better for the bottom 30% (even up 50%) of the population who took their anger out on Labour’s inability to do much for them by shifting to the SNP. Right-wing economics aligned with right-wing cultural policies could undo any of the good that has been achieved since World War II. And could yet take votes from the SNP just easily as Labour lost those same votes in Scotland. The economy is no side show: if we let it hang to the right both Unionism and the so-called free market of multi-national corporate capital will dominate not just the economic but also the cultural sphere. These are not mutually exclusive ideological (or policy) battles. The right are asking all too blatantly, why have economic hegemony and not cultural hegemony? Blair, Clinton, Brown et al failed spectacularly in their attempt to marry progressive -ish cultural policies with right-wing with economic strategies: The right are keeping their capitalist economics and in England, Wales and the USA they are succeeding in deconstructing a leftist sense of human solidarity and political progress- they make people afeared of the future, and fear is the weapon they use to justify their ugly policies and ideas. There is no room for complacency, if folk want to live in a decent world it is necessary to argue against capitalist exploitation for the some moral reasons as opposing racism or language suppression/oppression. These are not two different struggles, they are the same moral struggle for human liberation that has been going on throughout most of human history. Let us have a Scots Language Act. Let us have sustainable economic development that is real, no based in the fantasy credit world of private banking. Let us have a Scottish currency and a publicly owned and controlled Scottish National Bank. If these things can be made to work Scottish Independence will most certainly come. But if it’s seen as not being part of the one economic and social struggle we will be defeated by forces of division and fear so beloved of those on the right everywhere on the globe. I think you are right Jim that the SNP is a centre-right party, it is not a nationalist party in any normal meaning of the term. Were it the latter, we would already be independent after the 2015 general election result. Great comments from above and absolutely on the mark. It’s so insidious this rush to the right and it looks like they are winning the day but somehow not to run away is absolutely necessary. I believe it’s the covert rules etc. and the shift in affiliations on a subtle level that are the most dangerous aspect of this right wing agenda. And no fear cannot be the ruler for what is the point of living in fear. The Scots need to lift their heads high and only bow them when they are engrossed in reading a decent book on the truth of their history. Shouldn,t we all be celebrating the news now that the next colossal investment has been given the green light,the new British rail link to Leeds,it will create thousands of new jobs and lots of investment,no mention of the nether region that is Scotland,other than the comment from 1 Tory mp that Scotties would benefit by getting a link from our capital or Glasgow to the north of England,wonder how Ruthie will spin this. Sorry only now picking upthis thread. I’m reminded of how important the nationist artists were in setting the stage for Norway’s independence, 1905. First through self-awareness and uniqueness in a family of nations (Grieg and Ibsen most accessible), then through national identity and getting the job done (Bergsson etc later). Scotland has cast its own artistic seeds correspondingly, mainly late 20th century, but the ground has been more sterile. Or perhaps Sweden was less overwhelming than England?